The baby has grown rapidly to become a very healthy youth who will remain so for many more decades! The phenomenon responsible for the generation of electric power for feeding the modern world still continues to be electromagnetic induction. Questions on electromagnetic induction are generally interesting. Click on the label ‘electromagnetic induction’ below this post; you will find all posts on electromagnetic induction published so far on this site. Today we will discuss a few more multiple choice practice questions in this section. (1) Earth’s resultant magnetic field at California has magnitude B tesla and it makes an angle θ with the horizontal. Assuming that there are no other magnetic fields, what will be the voltage induced between the tips of the wings of an airplane of wing-span L flying horizontally with speed v? V = BverticalLv where Bvertical is the vertical component of earth’s magnetic field at the place. Therefore, the voltage induced between the tips of the wings of the airplane is BLv sin θ. (2) A plane square loop of thin copper wire has 100 turns. Each side of the loop is 10 cm long and the loop is oriented with its plane making an angle of 30º with a uniform magnetic field of flux density 0.4 tesla. If the loop is rotated in 0.5 second so as to orient its plane at right angles to the magnetic field, what will be the magnitude of the average emf induced in the loop? V = – dФ/dt where dФ is the change in the total magnetic flux linked with the coil and dt is the time taken for the flux change. [The negative sign is the consequence of Lenz’s law by which the induced emf has to oppose the change of flux dФ]. 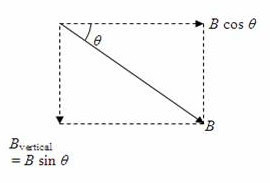 The angle θ is the angle between the magnetic field and the area vector. [Remember that the area vector is directed perpendicular to the plane of the coil]. Since the plane of the coil makes an angle of 30º with a magnetic field, the area vector makes an angle of 60º with the magnetic field. The initial magnetic flux linkage is NBAcos 60º = 100×0.4×0.01×(1/2) = 0.2 weber. Therefore, induced emf = (Change of flux) /(Time) = 0.2/0.5 = 0.4 volt. (3) Suppose that the resistance (R) of the loop in the above question is 10 Ω. What will be the induced current in the loop if the loop is kept stationary and the magnetic field is steadily reduced to zero in a time of 40 millisecond? The initial magnetic flux linked with the loop (as shown above) is NBAcos 60º = 100×0.4×0.01×(1/2) = 0.2 weber. V = (Change of flux) /(Time) = 0.2/(40×10–3) volt = 5 volt. When the rod slides down under gravity, the magnetic flux linked with the closed circuit comprising the rod, rails and the resistor R changes and a current is induced in the circuit. The induced emf is the motional emf BLv where v is the velocity of the rod. The induced current I in the circuit is BLv/R. By Lenz’s law the induced current has to oppose the motion of the rod. It is the magnetic force ILB which brings in this opposition. When the velocity of the rod increases, the opposing magnetic force also increases. When the magnitudes of the gravitational force (weight Mg of the rod) and the opposing magnetic force become equal, the rod moves with a constant (terminal) velocity. If the direction of the magnetic field in the above question is reversed, will the rod still attain a terminal velocity? Think of it and arrive at the answer ‘YES’. You will find a few more questions (with solution) in this section here.